The Mediterranean jewel is working hard to be seen as more than just a holiday destination. The island is keen to broaden its appeal beyond sun, sea and sand-seekers, and Limassol is not the only place expanding its event spaces. A state-of-the-art cultural centre, which will host meetings for 1,400 delegates, is under construction in Nicosia and will be completed in time for Cyprus hosting the EU presidency in 2012. For all-suite luxury, book delegates into the recently opened five-star Asimina Suites Hotel, which offers 121 rooms, ranging from junior to executive suites, with private pools and jacuzzis. Leisure facilities include two pools and the Elixir Spa, offering thalassotherapy and aromatherapy treatments, gym, massage, steam room and sauna. The property is on Kato Paphos beach, 2km from Paphos centre. The Ayii Anargyri Spa Resort opened last year and is perfect for corporate retreats. Set in a valley of trees, the resort has 56 rooms, a spa, pool and serves traditional Cypriot fare. For meetings, it can host 100 delegates, while incentive groups can enjoy nearby outdoor pursuits such as cycling and bird-watching or relax with a glass of wine from the resort's vineyard. 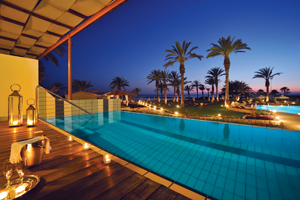 The five-star Amathus Beach Hotel Limassol re-opened last year following a £13.5m refurbishment and expansion. The Leading Hotels of the World property has a spa, three restaurants and four conference spaces for up to 400. The island is also developing its incentive offer, with the Nick Faldo-designed Elea Golf Club opening near Paphos in October. It will be the centrepiece of Elea Estate, a high-end development with a boutique hotel, a range of dining options and a spa. Larnaca is also in the process of upgrading its marina area, and new airports in Larnaca and Paphos have helped improve accessibility.